If stability and comfort are your top priorities in an RV, look no further than fifth wheels. These hardy campers provide the best maneuvering and are quite spacious and luxurious. 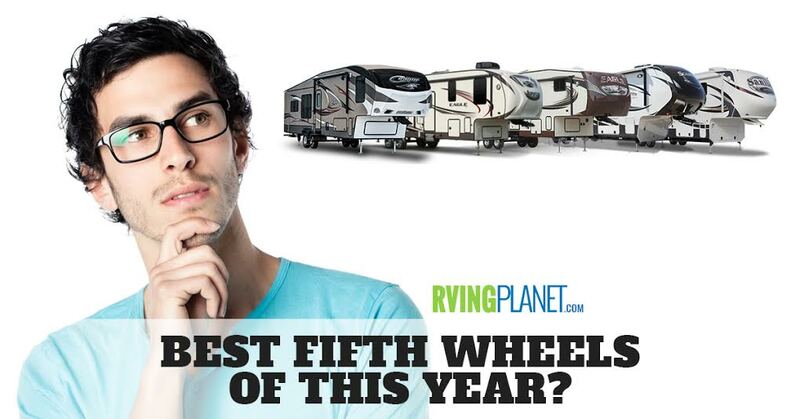 Read on and take a look at our list of the top 5 best fifth wheel RV brands! What puts an RV on the list: Getting a top 5 list of the best fifth wheel brands basically means we’ll need to sift through every brand in our library, which means there are tons of good options. However, the best of the best are the ones with the top ratings from users, have the most recent models available for state-of-the-art features and also feature a good set of floorplans and expansions for versatility and the ability to expand for extra space! The One And Only RV From Redwood! 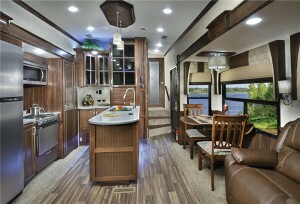 View All Redwood RV Redwood Fifth Wheel Floorplans! 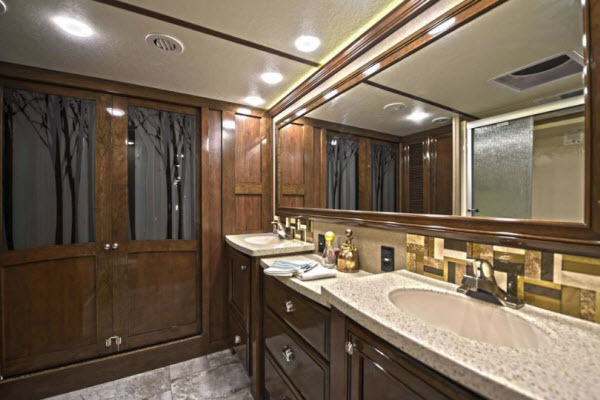 Why we recommend the Redwood RV Redwood fifth wheel: An 8-Year old company from Indiana with only RV in its library, you may or may not have heard of this Indiana-based company. However, those who have and tried its fifth wheel have nothing but good things to say about it. It features 18 floorplans with 4-6 sleeping capacity and a 36 to 41 feet footprint, which means you have tons of room available. We recommend checking out the Redwood 3401RL and the Redwood 382RL. Redwood has made many additions and improvements to the rig over the years. Take a look at its extensive feature list that includes dual pane windows, two 15,000 BTU air conditioners, solid surface countertops with tons of space to work with, an HDTV in the bedroom, soundbar, over sized electric brakes, solid constructions, just to name a few. Opting for their ‘Redwood Parks Package’ adds a slew of additional features too. Check out the features tab on the RV’s floorplans page for more details! 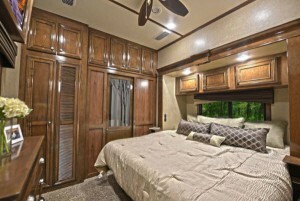 View All DRV Luxury Suites Mobile Suites Fifth Wheel Floorplans! 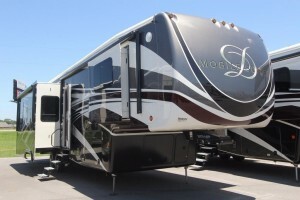 Why we recommend DRV Luxury Suites Mobile Suites fifth wheel: If towing weight isn’t much of an issue for you, then the bulky Mobile Suites from DRV Luxury Suites’ stables are a great option. Built like a tank, and having tons of room and storage space, it’s obvious that they made these bad boys with luxury in mind. 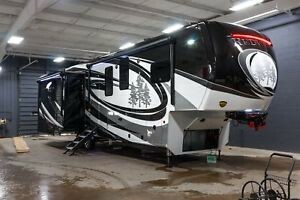 You have a massive 44-feet length or a 34 feet if you’re bringing 3 more people along, which should still be quite spacious even after considering that it’s a fifth wheel. 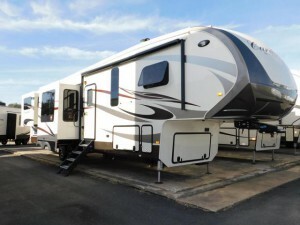 We recommend checking out the Mobile Suites 32RS3 and the Mobile Suites 44 Santa Fe. It goes without saying that such a weight range means that the DRV luxury suites will can take a hit or two, not that it might come to that since fifth wheels in general are quite stable and this camper is no exception. 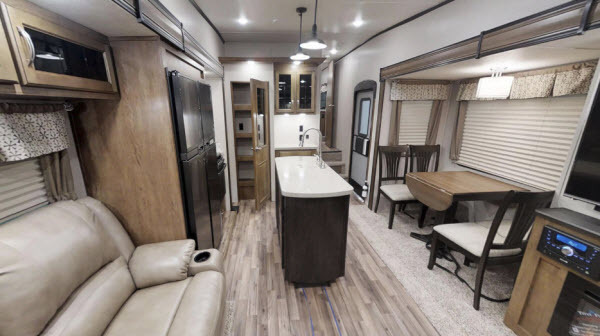 The 8-inch interior ceiling height adds to that spacious feeling, while the vinyl plank tile, the custom hardwood dinette, the hazelnut/mocha cherry cabinetry and the LED lighting makes it truly feel like a quality fifth wheel. It has a few standalone options as well as a package that adds a few impressive ones on its own, which makes it quite clear that the Mobile Suites is one of the best fifth wheel RV brands out there! 20 different floor plans available! View All Coachmen Chaparral Fifth Wheel Floorplans! 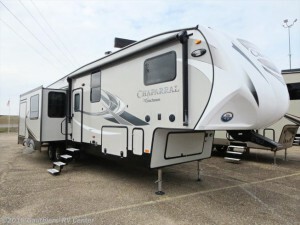 Why we recommend the Coachmen Chaparral fifth wheel: If your priority is towards a fifth wheel with better sleeping capacity, then you are in luck! 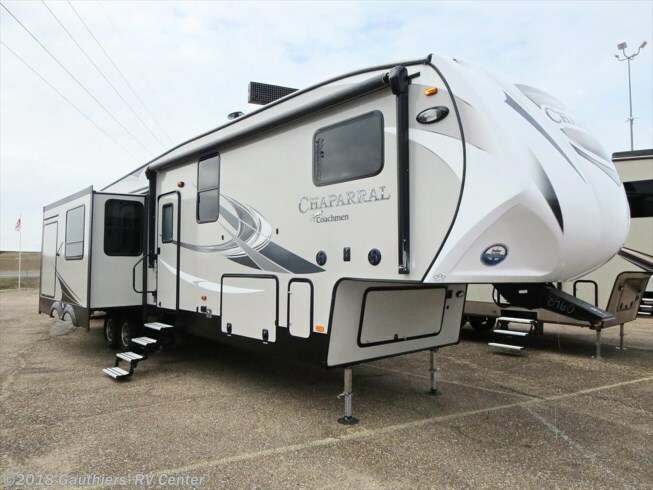 The Coachmen Chaparral is the perfect camper and can house as many as 11 people in it thanks to its bunkhouse floorplans and since those floorplans generally have 40+ feet length, you shouldn’t find it to be to cramped even when traveling with more than a few people. With that in mind, we suggest the Chaparral 31MBRB and the Chaparral 370FL. This fifth wheel has also proven itself to be quite impressive when it comes to features. On the outside, it’s painted with UV treated and weather resistant decals to make sure that your fifth wheel looks in tip top condition. 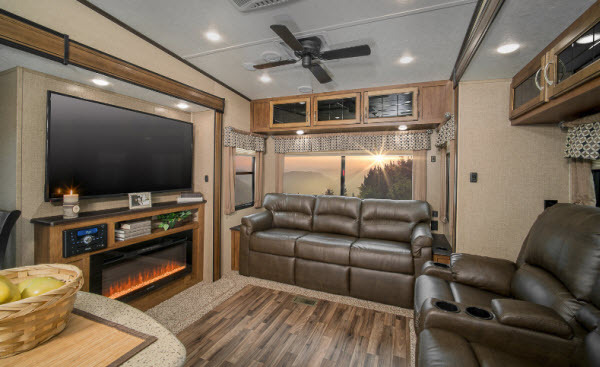 Head on inside and there’s a myriad of features along with many options to improve your camper’s capabilities such as a huge 50/55″ TV, panoramic sofa, wide electric fireplace, dual pane windows, a second 13,500 BTU air conditioner in the bedroom among many others! Suitable For Beginners, A Treat For Modders! View All Forest River Cardinal Fifth Wheel Floorplans! 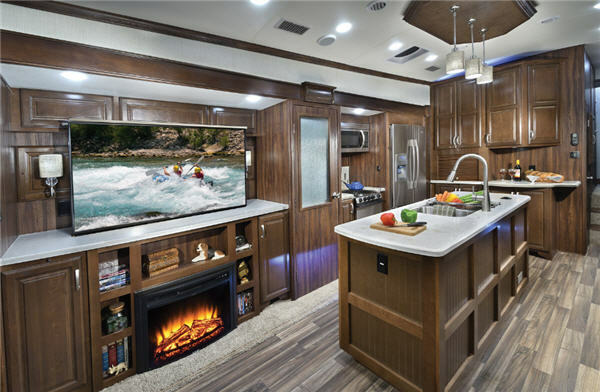 Why we recommend the Forest River Cardinal fifth wheel: You’ll notice the specs of the Cardinal Fifth Wheel to be quite similar to our other top 5 travel trailer RV brands choices here, and hence equally admirable. 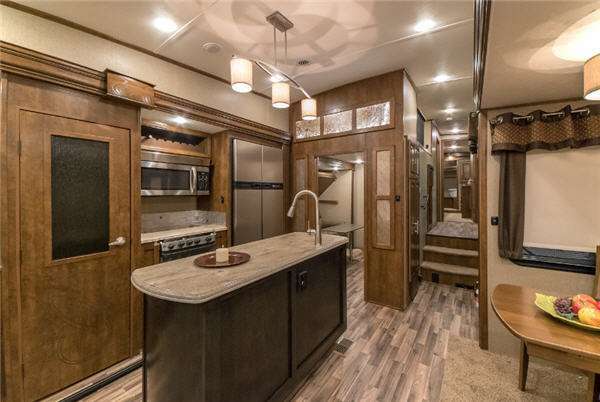 7 floorplans that span between 34 and 41 feet in length and can hold 6 people make this quite spacious, especially if you choose a floorplan which is 40+ feet in length and is only made to house 4 people, such as the Cardinal 3825FL and the Cardinal 3456RL. 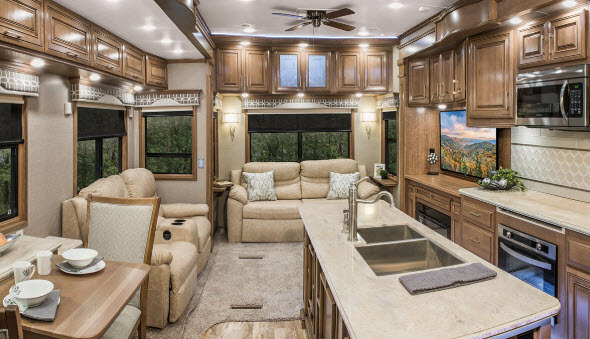 Even when you look at the features, the Cardinal doesn’t disappoint, with lots of safety features, interior decor, exterior construction quality and luxury-based features added that make traveling on this RV a treat. However, where the Cardinal truly shines is in the upgrade department, where there are so many options provided that you’ll definitely be confused on what to add/upgrade first. Of course, if you are a beginner and are just starting with RVing, the Cardinal is just as good and stable in it’s ‘vanilla’ version. The Perfectly Stable and Roomy 5er! View All Coachmen Brookstone Fifth Wheel Floorplans! 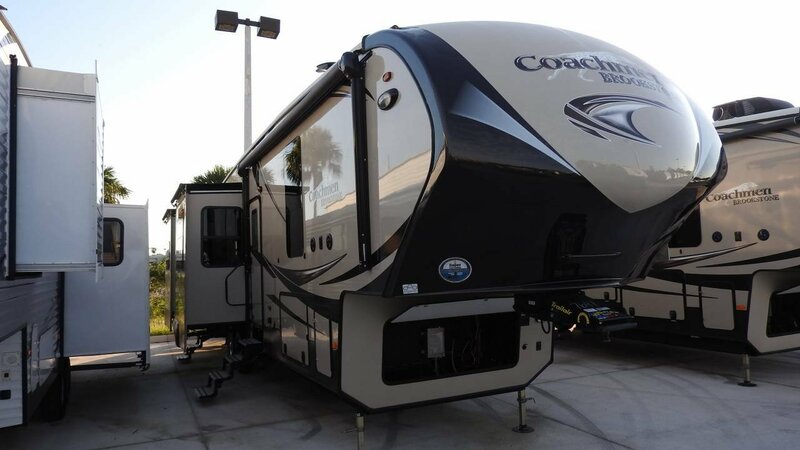 Why we recommend Coachmen Brookstone fifth wheel: As far as Fifth Wheels go, the Brookstone is one of the 4 awesome brands by Coachmen RV, sporting dozens of happy users which are using its well built and well-supplied fifth wheel with ease. 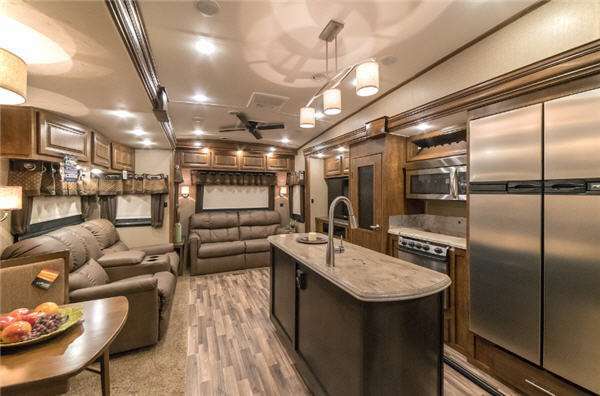 Like all fifth wheels, this one is pretty stable too, and can house up to 9 people with its Brookstone 395RL floorplan, which is quite commendable as you don’t find these all too often in fifth wheels. Of course, if it’s just your ‘family of 4′, then a floorplan like the Brookstone 325RL will do you just fine too. This camper also has all the bells and whistles you can expect from a premium fifth wheel and adds a few unique features into the mix as well. For example, apart from the 40,000 BTU furnace and the 15,000 BTU central AC, they’ve managed to add an inclining bed instead of the regular bed, electric front jacks aside from the regular jacks, a cell phone charging station, lots of storage for the kitchen, a rubber diamond coating on the pass-thru storage among many others. And, on top of all of that, it’s got lots of options to improve its capabilities like all of the other travel trailers in our list! Check out these similar RV reviews! Stability and luxury won’t be an are not the only things to consider when you’re purchasing a fifth wheel. There are other factors that you need to take into consideration before purchasing a fifth wheel. We hope this list will help you make an informed decision. Share with us your favorite fifth wheel travel trailer RV brands in the comments below! Amy is an RV Writing Enthusiast who grew up camping in her family’s pop-up camper, the source of some of her fondest childhood memories. In addition to her love for the great outdoors and everything RVing, her passions include family, music, and sports. 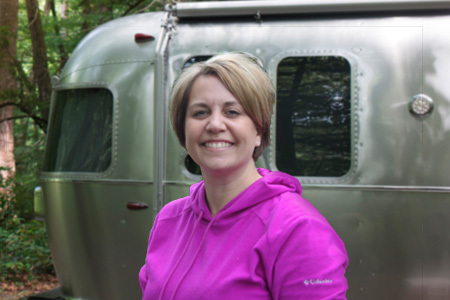 She enjoys spending time around the campfire creating new memories with family and friends and bringing her experiences with RVing to others interested in this wonderful lifestyle.